So - she's been in for about 15 months. Quite a strange feeling to have her up in the yard again. 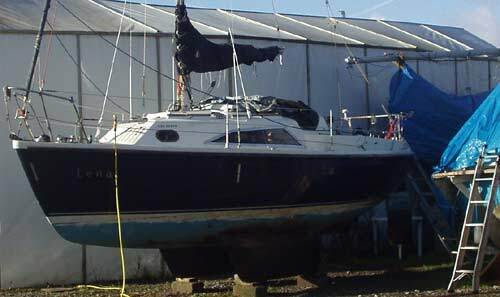 Several things on the list - apart from obvious bottom cleaning/antifouling. Mast needs to come down - albeit briefly, to sort out the top of the furler fitting - which, though strong, was not quite as I intended. Nasa wind rotor needs refixing - or I may scrap it and fit a Raymarine, if I can sort out somewhere to locate the rotor stalk. May change the backstay to two separate stays - scrapping the bridel and tensioner. She's been scrubbed down here - but the dark stuff is odd. Apparently 'normal' around here on boats in the Axe mud - it's almost like dark brown varnish - quite smooth, and very stubborn - and smoother and darker the deeper in the water it is. I'm going to try it with some scotchbrite pads, or stainless pan scourers - but maybe be rough wet and dry job. I'm wondering if it would respond to any chemicals - so may just try a few just to see. It does not look very 'organic' to me - more a 'mineral fur' - sort of a black version of what you get in the kettle. Maybe Hydrocloric ( cement cleaner ) might be worth a go. I think I have sorted out a place to permanently mount the solar panel. Now I'm sailing mostly with the sprayhood down - I realised it would go on the coachroof slide - with enough clearance not to be obscured with the sprayhood down, and the slide open or closed - or with the sprayhood up and the slide open. I would just have to leave the hood down when not on the boat - not a big issue. Once the rains and gales had abated - armed with some Hydrocloric 'patio cleaner' - basically its 'brick cleaner', dissolves cement - and some goggles and gloves. Worked a treat - just have to leave it on a bit and scrub it around with an old brush. The antifoul under it is quite intact. Stayed aboard for the night and froze myself stiff - but had a good early start once the sun was up a bit - lovely day, but freezing cold. Just the underbelly to do, but it seems thinner there and comes off easier. 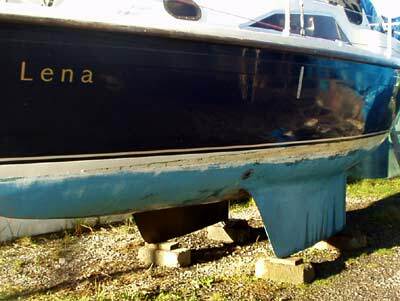 I'll then give it a wet sand on the old antifoul - which seems nice and stable. Quite impressed with Seago Hard Antifoul - well it seems to work ok around here - or maybe the mud is doing its stuff ? Will re-do it with the same in spring, but use white around the waterline - then maybe fade it in to blue lower down. See if that stops the green slime - but I'm thinking it might be the white colour, itself, thats encouraging it. Its worse on the sunny side of the mooring and forms just on the waterline. I scrubbed it three times last year from the dingy ! I see All Gadgets have a great price on the Raymarine ST40 Wind - so may scrap the Nasa. I could take it off - fix the rotor and sell it on. The Raymarine is a much smaller unit - and I've been very impressed with the Bidata speed /log. Depends on whether I'm tempted to upgrade to a chartplotter - so maybe just fix up the Nasa for another year, see if it lasts. The rotor has just fallen off it, intact. Obviously, whatever it was stuck in with was not really very 'sticky'. Probably designed to self destruct two months past warrranty ! Crap really - I say it sagain, Nasa wind rotors are crap. Shaft annode I put on is 'well' corroded away - so thats done its job. Cant seem to get a 'collar' type anode in 19mm ( 3/4 ) only 20mm. The longer curved type are too long - I had to hacksaw it off - and zinc does not cut too well, even with a grinder. Main anode on the hull is doing something - small pitting here and there. Took off the sails, ( yard wanted them off ) and various ' tempters'. Sorted the new solar panel location - and have now drilled out some fixing screws, so I can split pin through the nut inside. The flexi water tank in the vee-berth needs cleaning - its gone so foul, just the smell of it is evil. I've got some puriclean stuff - or it will get the domestos treatment. Drained the engine, disconnected exhaust from water trap - split the intake hoses, etc and covered the intakes. Do a general service in spring, oil and filter, fuel filter, thermostat, engine zinc etc. The impellor was new with the new water pump last Aug - so its only done maybe 30 hours. Main modifications will be to the mainsail raising/lowering - and maybe the reefing system. Singlehanded, I'm more interested initially in a way to drop the main without going up to the mast - but the first two reefs would be good, so long as its bullet proof. I've a few ideas - that would suit this boats set up, not all. The main problem is the sail slug track - which at present does not go right down to the boom - so to set a reef you have to remove the two slugs. I'd have to sort a way to alter the track - which is not obviously that easily done. May just do the main hoisting - and leave the reefing as it is.